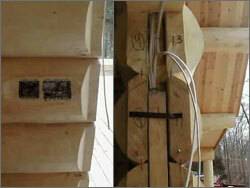 BigLog Homes can provide both highest quality chinkfree and chinked styles of log homes. If you prefer the look of a chinked wall, We welcome the opportunity to provide you with the Timberchink products that you can use. of Timberchink chinking products is roughly textured. Use 30 oz or larger cartridge based applicators or a good refillable caulking gun if your material is in pails. You will need several types of paddles or trowels or putty knives or strikes to trowel the material into place. I would very highly recommend using masking tape to limit the spread of the materials, lower the cleanup effort and make for a crisp, professional appearance. Where excessive voids appear in the wood or the insulation, fill the voids with something, maybe, some of the styrofoam or some aerosol foam or backer rod (backer rod is round foam rope, in sizes ranging from 1/8" up to many inches.) Foam backer rod is an excellant filler behind caulking. Large bulky "pockets" of caulking and chinkng must be avoided.